Greek creativity has no limits. ''The New Face of Greece''. In one of my trips abroad 6 years ago, I noticed a lot of Greek products in elegant food stores and I suddenly realised that Greece had to offer something more than the excellent olive oil or ”feta”, more than the typical ”mousaka”, ”souvlaki” or the picturesque sunsets of Santorini. When I returned home, I decided to create a platform that would promote all over the world ”the new face of Greece”. Small boutique hotels, jewellery and fashion designers, gastronomy, musicians, local food/cosmetic products, and artists. A big database that would collect all the innovative brands, products, or ideas. I tried to find partners to share the same vision with them. It took me 6 months to find them. People were depressed, most of them didn’t understand why i should start something like this. But i insisted. My ”postcards” would represent the country everyone would like to live in and create a new ”future”. The ultimate goal would be to unravel the old stereotypical images and to bring forth a refreshing new image and dimension. 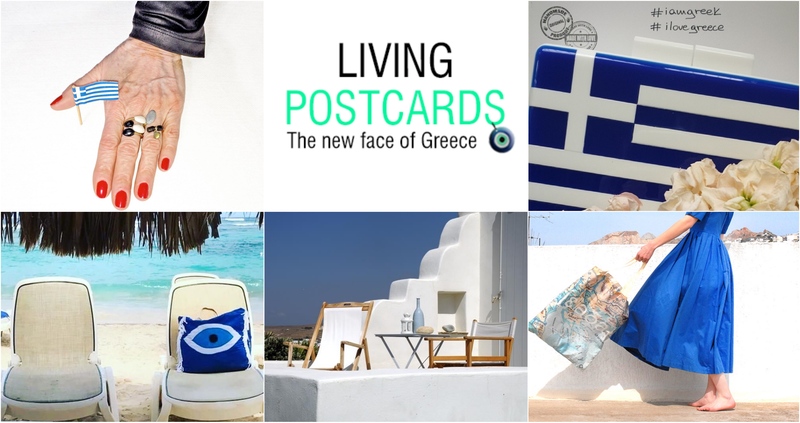 So, in November of 2012 the English version of Living Postcards embarked upon the difficult task of compiling a variety of new enterprises that collectively would depict “The Νew Face of Greece”. The media loved the idea, people started to support us, and many collaborations happened out of nowhere. I felt i was right after all. Deep in my heart i knew that the last years with the crisis in our lives, and the big financial insecurity many people started to ”think outside the box”. For me and my team, crisis brought the sense of creativity in difficult times. The resounding response to those who believe that the economic problems has reduced talent, or dreams for progress. The smell of young people, intensely left behind them, that of the fresh ingredients, transformed into design masterpieces, and that this is the beginning of a new Greece. And that’s the whole meaning of the ”Living Postcards” global platform .